We'd like to teach the world to swim! April 30, 2018 May 18, 2018 - 2 Comments. Are swimmers typically dehydrated? True or False? One would think a statement like this couldn’t possible be true. Given the notion that swimmers are splashing about in relatively large bodies of water, it seems highly unlikely. Yet, swimmers can be dehydrated, despite their surrounding. In fact, some swimmers may be severely suffering and not even aware. What’s the Science of Dehydration? De·hy·dra·tion noun – the loss or removal of water from something. We are three fourths water and cannot survive without it. Our bodies will not function properly unless we consume this liquid and have it utilized throughout. Aside from regulating our temperatures and lubricating our joints, it also flushes waste out of our bodies regularly. These are essential functions without which, bodies can become infected, over heated, malfunctioning, and the like. The human body can even die from a lack water. It’s so essential, LiveScience says that our bodies can only live two days to a week without it. (Please note, these are estimates vary from person to person). This is a very good question. Dehydration can mask itself in many ways, depending on the individual. Some may say they feel thirsty, and this is an appropriate response to a lack of water. For others, unfortunately, dehydration can alter body functioning where effects are not as obvious. If you have migraines, angina, hypertension, asthma, arthritis, muscle cramping, or even organ failure would you initially consider these as signs of dehydration? Of course not. Wouldn’t it be wonderful if our bodies could clearly alert us when essential elements were missing? Dehydration is so pervasive that hospitals administer intravenous (“IV”) drips to patients upon their arrivals in efforts to increase their fluid levels. There are four main fluids given for this purpose: saline, dextrose (sugar), electrolytes, and vitamins. Click Here for more information. The interesting thing is that after the IV most patients already feel better. How many glasses of water a day? Many doctors and nutritionists advise their patients and clients to drink eight glasses of water a day. This is considered the prevailing wisdom of late. In truth, there is a lot of chatter in the health community whether this recommended amount is fact or fiction. In reality, water consumption can never be a one size fits all scenario. 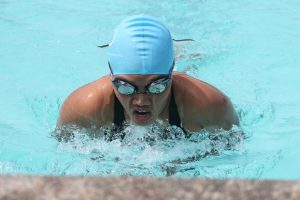 Swimmers who, at a moderate pace, swim for a half an hour daily may require eight glasses of water a day. However, Olympic swimmers, practicing several hours a day, will need more. Their bodies are sweating as much as other athletes in comparably intense, non-water sports. Both are burning energy and body resources at elevated rates, and losing fluids rapidly. The best way to determine the correct amount of water to drink per day is to start with eight glasses (8 ounces, 236 milliliters). Listen to your body. If you feel fine and your body is functioning normally, continue. However, if you experience headaches, nausea, diarrhea, or any nutritional discomfort, make an adjustment. Also, as with all health related matters, consult your doctor first. As previously stated, while submerged in water, swimmers are sweating out fluids through their pores. Test this premise by swimming a few hard laps and then licking your skin. Taste salty? That is sweat and it is necessary to maintain body temperature. Depending on how long of a swim, and at what intensity, the amount of fluid loss will determine the level of dehydration of the swimmer. 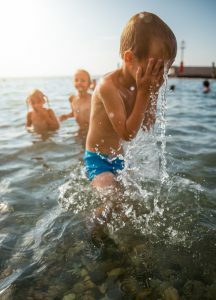 Dehydration can be very dangerous when swimming in salt water. During these dips, swimmers take in a certain amount of sea water by their mouth and nose. Unfortunately, the body needs to expel excess salt and our kidneys can only urinate water less salty than that of sea water. The necessity of fresh water plays a significant role here for diluting the salt water in the body and allowing it to pass through the kidneys. This is how someone stranded in the ocean can die of dehydration. Are There Foods That Help With Dehydration? There are many other foods with high water contents. Select those you like and add them to your swim snack bag, particularly on those long practice days. All exercise intervals require proper nutrition before and after. There have been times after an intense swim where I’ve been cramped, tired and starving! Now, after years of experience, I know that I may have been dehydrated. I have a banana (74.91% water content) before a swim. The potassium content helps with the cramps. The natural sugar helps with the tiredness and the water within keeps me from being dehydrated. Afterwards, I’ll eat whatever I like, usually lunch or dinner, depending on the hour, and have plenty of water. I enjoy drinking ten glasses of water a day and feel as if I function best with that amount. If possible, try a water diet. Eat normally. I repeat, eat your regular meals, but make all your fluids water. Do this for one to three days. I know what you’re thinking. I too, love coffee and know that it’s 98% water. Unfortunately, caffeine is a diuretic, meaning we urinate the water out quickly. In an effort to assist our bodies, this so-called water diet will hydrate and improve functioning. Who knows, you might even enjoy it! For those who’ve read this post and feel they are severely dehydrated, please consult with your doctor. Swimfolk recommends a great book on the subject of dehydration called Your Body’s Many Cries for Water, written by Fereydoon Batmanghelidj. Click on the book title link above for a FREE sample. Your health is precious. Hopefully, what you’ve read today helps you maintain it. If this post has been helpful, please leave a comment below. Is It Safe to Go Swimming with a Tampon? 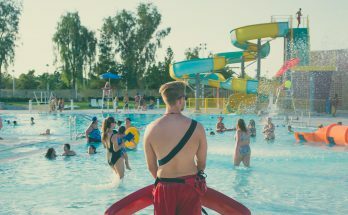 Previous Article Is It Safe to Go Swimming with a Tampon? Muscle cramping is another sign of dehydration. Athletes from all sports, but maybe especially swimmers should take care and pay attention to their fluid intake. Cramping while swimming can be fatal. 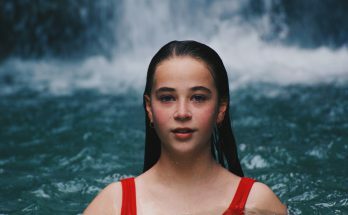 Beverly on Fevers After Swimming – What Causes Them? 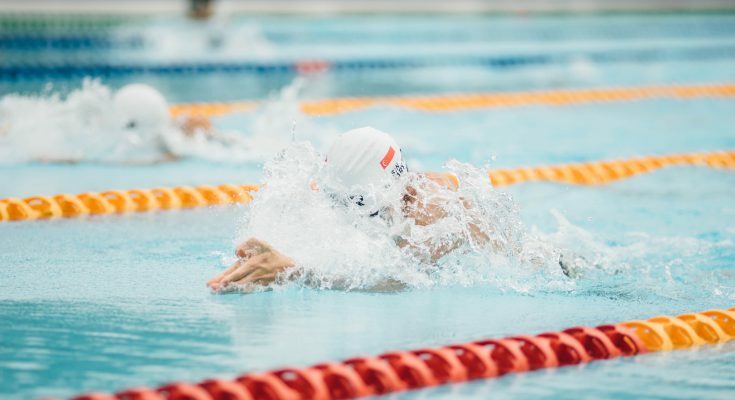 Lisa McColl on Fevers After Swimming – What Causes Them? 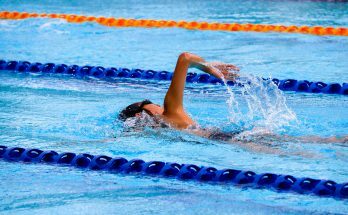 Rushi Ab on Fevers After Swimming – What Causes Them? Beverly on Are Swimmers Typically Dehydrated? R. McClain on Are Swimmers Typically Dehydrated? We’d like to teach the world to swim!